I am really loving this ink!!! It's amazing and super super opaque and permanent as all hell! I've been killing it with white and with black! I've never seen a white ink this f*ckin white before,so bright it shines! Bought empty AP markers and mops and filled them up withis ink and going to town. 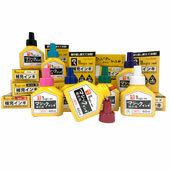 You gotta love the bottle this ink comes in,easy to fill your markers or mops without making a mess. And there's a good amount of ink in here, you can fill up an art primo empty jumbo marker w 15mm nib and still have half a bottle of ink left! I'd recommend everyone to get at least 2 bottles of this juicy Gucci sh*t!